Introducing Swiss Army Steel: the new and distinct fragrance in the Victorinox range for men. Resolutely powerful and magnetic, it captures the vibrant and refined essence of the modern man. Taking inspiration from the strength of steel itself, the dynamic scent blends energizing aquatic notes with a charismatic twist. The bold and square-shaped flacon bears our iconic Cross & Shield emblem crafted of steel refined at the Victorinox knife factory in Ibach, Switzerland. Elemental and robust, Swiss Army Steel echoes the spirit of enterprise, ambition, adventure and lust for life. 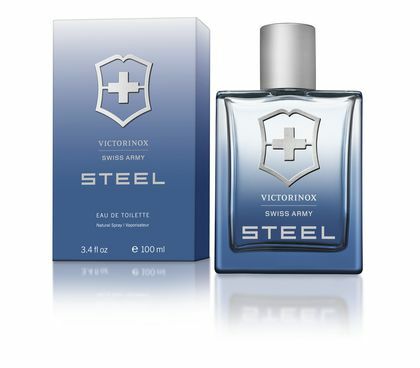 Swiss Army Steel is an aquatic deep fresh fragrance. The senses are awakened by the crisp vegetal bouquet of viola leaves mixed with inherently masculine lavender. Yet, it is the watery woody composition that makes this scent really stand out. It reveals a refreshing sea breeze accord which blows intensely to form an enduring and luminous experience for the senses. The blue note is complemented in harmony with a green hint of lichen while cedarwood sends out a vigorous signal. Feel the fusion of refreshing aquatic accords with the magnetic power of steel and explore our new signature scent. Swiss Army Steel surrounds you with confidence, sophistication and natural energy.